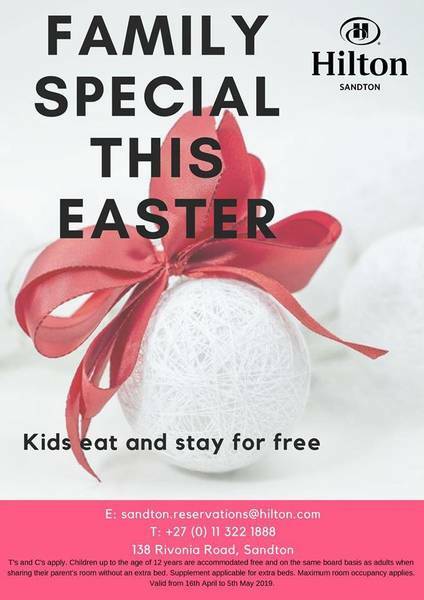 Family special this Easter at Hilton Sandton. Kids eat and stay for free. Book now on +27 (0) 11 322 1888 or sandton.reservations@hilton.com. This offer is valid from 16 April to 5 May 2019. Set among landscaped gardens and suburban surroundings, Hilton Sandton is located just north of Johannesburg in the city’s business district. Guests have easy access to the Gautrain, Stock Exchange, Global Banking Institutions and Nelson Mandela Square. Modern guest rooms and a host of amenities make our hotel the ideal base for exploring Sandton Central.